Lighters are handy tools that can offer a lot of utility in many different scenarios. 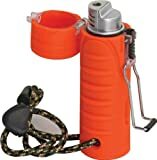 Whether you spend a lot of time in the wilderness or just want to have the proper tools in case of an emergency, a windproof torch lighter can be an invaluable tool, providing a lot of utility (as long as it’s reliable). There are a lot of factors that will affect the overall quality of the products, such as the number of ignitions, materials used in their design, the actual wind resistance, all of which we’re going to discuss in the following sections. Watertightness. It goes without saying that the best windproof lighter will be waterproof or the case will be watertight. Because they’re essentially survival gear (more or less), their design must be infallible, so a watertight case will protect the lighter from suffering damage during storms and floods. Windproofness. Wind is probably the biggest problem when trying to use a lighter, as it’s the most common. You’ll find that some brands perform better than others, although both products have been advertised as “windproof”, which is true to a certain point. Ignition. Another thing to consider is the ignition, which you should choose depending on how you want to use it. A windproof electronic lighter won’t be as useful for starting a fire as a windproof lighter Zippo since one burns like a torch and the other like a match. The Zippos even burn independently, so you just have to ignite the flame using the flint system, while with an electric lighter you’ll have to constantly control the fuel stream to keep it burning. That being said, there are some other factors, such as design, extra features, quality etc. that aren’t limited just to lighters. Let’s take a look at some of the best survival lighters on the market. UST Brand has been around the market as early as the 1930s, giving it plenty of time to acquire a taste for quality products. That being said, let’s take a look at the Trekker Stormproof Lighter and why it’s featured on this best survival lighters list. First of all, the color – the case is made using a rubberized material, colored in a bright, neon orange. This is great because lighters are easy to misplace or lose, and this will make the Trekker very easy to spot. The rubberized case has a very nice grip, so it won’t slip during storms, another nice touch to the design. The case is closed using a hinge system, but the hinge isn’t all that great. You have to handle it with care, as it’s a little fragile. What’s surprising about the Trekker is that the lighter itself is watertight, designed with a stainless steel wire closure and an o-ring seal, so if the hinge does fall apart, you’ll still be able to get it wet without worries. It can withstand fast winds without any issues, and the Piezo-Electric ignition system is tested up to 30,000 uses. It uses quadruple-refined butane fuel and, at the bottom, you’ll find an adjuster for using at different altitudes. Another great product to add to the best torch lighters list. The Match Pro Lighter is designed using stainless steel, with a screw-on cap that fits perfectly and a little clipper that’s attached to the top, so that you can lock it on your backpack and keep it safely in place. The stainless steel will make it shine in case you lose it, but in dimmer lighting, you’ll be struggling to find it in case you accidentally drop it. One of the best butane lighters, the Everstryke Pro is tough and durable. It uses a flint and wick ignition system that’s ideal for one-handed use and will continuously burn after you strike it. The flint is replaceable and the kit comes with extras, so you won’t have to worry about it not being reliable, you’ll just have to carry some spares around in case of emergency. The screw-on cap will prevent your fuel from evaporating, so a small amount will go a long way. One of the drawbacks of this particular lighter is that it’s not very windproof and while it is waterproof, it’s only waterproof when sealed – you might have trouble using it during storms because of the flint-wick system. 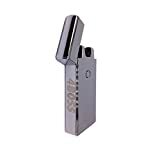 The 4BOSS Luxury is a windproof electronic lighter, as it uses a flameless ignition system. The sparks will ignite anything between the two arcs. This is an all-around great product, as we’ll further discuss. One of the best windproof lighter camping, the 4BOSS Luxury electronic lighter will be able to function in any wind, because it’s flameless. The battery is rechargeable via USB and is advertised to work properly for up to 300 charges. The high-grade metal used in designing it is very, very tough and durable, so it will even keep a nice appearance, as it’s very scratch resistant, let alone maintain full function after withstanding damage. The lid seals the ignition system like on any normal Zippo lighter, but the 4BOSS Luxury isn’t watertight – it’s splashproof. It’s eco-friendly and you can even use it as a – wait for it – taser! The button is placed on one of the sides, and you can use the sparks to light paper, dry leaves and anything else that you’ll need when starting a fire. What’s not so fun is that you’ll need to keep it charged, so in case of emergency, you won’t have enough time to plug it into a USB port. Is the TekFire the best lighter in the world? Let’s see what it has to offer and find out. It has an orange rubber case, easy to grip and easy to hold onto due to its wrist lanyard. This is another flameless lighter, using the same electric arc ignition system – same things apply. The only things that make this one different are the rubber case that offers it more water resistance than the Everstryke Match Pro Lighter and a much cheaper price. 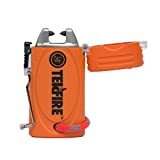 So far, I’m inclined to think that TekFire (part of the UST brands) is the best torch lighter brand. One more thing to add – this one comes with a 2-year manufacturer’s limited warranty, bringing even more value to it. Another UST product, the Windmill Delta Stormproof is designed using a lot of thought. Let’s see what this lighter has to offer. First of all, it’s windproof and watertight – an ideal combination that you want to have when venturing into the wild or in case of an emergency. The elastomer armor that’s protecting the device is somewhat reliable, although not the best choice. The fuel ignition system is, again, a Piezo quartz system. It’s tested for up to 30 000 ignitions and it doesn’t require any sort of charging, but here’s the thing – it’s more prone to damage. Designed with a steel wire closure and an o-ring seal, it is, as previously stated, watertight. You can use it during windy storms or after it has suffered water exposure with no issue. That being said, it isn’t the most reliable torch lighter out there. The “armor” is too soft and extended use might damage the ignition system. It holds up to 1g of fuel, but this lighter is fuel-hungry – you need to carry extra fuel and charge it pretty often. 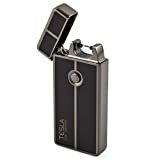 Tesla Coil Lighters is a manufacturer that gives a great deal of attention to its product design and quality. The Tesla Coil is a lighter that’s ignites using the dual-arc system – electric, eco-friendly and no fuel required. What’s great about this one is that it’s very similar to other “high-end”, offering the same features for a fraction of the price. It even looks great. This might be the most reliable torch lighter on the market – you just need to keep it charged and avoid wet environments. I know, not having any sort of watertight and splashproof features doesn’t bode well, but everything else will work perfectly. You only have one button and a USB slot – not a lot of things that could be damaged. While the cap is closed, the ignition system will be disabled, even if you press and hold the button. Try keeping it out of the sun and away from kids, and you’re good to go. Designed by Dreambay to be an everyday carry item, the Peanut Lighter, cleverly named after its two-part design, is possibly the best windproof butane lighter on the list. The fuel will last for a long time, because of the flint and wick ignition system that’s proven to consume less fluid. 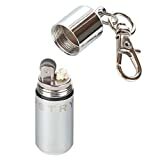 The peanut windproof lighter zippo is designed using stainless steel, with a lid that protects the ignition system. The screw-on lid ensures that the ignition system will remain intact and functional in case of any emergency. Upon purchasing, you’ll receive a package that contains a windproof wick, six lighter flints, and two waterproof o-rings, all for a great price. What’s even cooler is that every flint is tested up to 15 000 of individual strikes, which offers this product a very big lifespan. This concludes our review of what we think are the best windproof butane lighter and electronic lighter choices. While we won’t give the best lighter in the world title to any of the listed products, rest assured when we say that they’re all great choices.